News from LMCU: Have you tried mobile check deposit yet? Have you tried mobile check deposit yet? 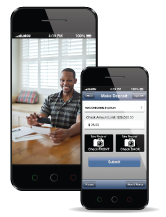 Deposit your checks anywhere...anytime with LMCU’s Mobile Check Deposit feature.